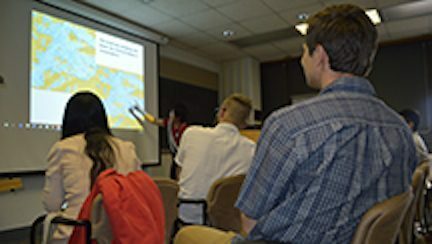 View the fall 2017 UROC Coffee Hour lightening talks on these projects. Click on a project title to link directly to the project description. Scope: This project will require 90 hours of work over the course of the semester, and the successful applicant may earn 2 credits for the fall term. This research utilizes multiple data sources generated during emergencies to improve the identification of flood mapping. The goal is to augment remote sensing imagery with new open-source datasets to generate flood extend maps at higher temporal and spatial resolution. The student will be responsible for making maps, digitizing information, analyzing spatial data at different spatial and temporal resolutions. The student should be familiar with ESRI Software and RStudio and be comfortable performing varieties of image and photogrammetric processing. Duties will also include creating simple instruction guides (documentation) as needed and organizing data. Successful completion of GEOG 361, 362, 363 with grade of B or higher; familiarity with ArcGIS, RStudio, image processing. Must be detail-oriented and have good organization skills. Scope: This project will require 45 hours of work over the course of the semester, and the successful applicant may earn 1 credit for the fall term. Seeking a research assistant with interests in international food politics. More specifically, this project involves media analysis of the beef ban that was passed in 2014 in certain states in India, and the violence and resistance that followed from it. I have prepared a large repository of media articles focused on this issue from the last three years, and the RA will code this data inductively and deductively using qualitative coding software. If the RA has interests in cartography, the project can be expanded to include temporal mapping and geovisualization of the beef ban and violence following from it. Applicants should be well organized, and have a knowledge or interest in qualitative coding. The student should have completed GEOG 20 and one other human geography course with a grade of A- or higher. If the student is interested in doing cartographic representation as part of this project, they should have completed GEOG 361 with a grade B or higher. Scope: This project will require 45-90 hours of work over the course of the semester, and the successful applicant may earn 1-2 credits for the fall term. The student will have the opportunity to learn to transcription and coding practices and learn about other qualitative research methods. This project involves transcribing 20 one hour-long interviews from Nepali into English and will also involve instruction in coding of the interviews. The interviews were conducted over the summer of 2017 in Jumla district and ask farmers about their participation and involvement with a seed project involving local crops. Scope: Candidates must be willing to contribute 45 hours of work toward data collection over the semester, resulting in 1 credit applied to the transcript. Data analysis would result in another credit, entailing 45 hours of further work, for a total of 2 credits in the fall term. Applicants should be well organized, and have a knowledge or interest in qualitative coding. The student should have completed GEOG 20 and one other human geography course with a grade of B+ or higher. Scope: This project will require 45-135 hours of work over the course of the semester, and the successful applicant may earn 1-3 credits for the fall term. Seeking a motivated undergraduate who is interested in learning about organic agriculture, the global food system, and social movements concerning sustainable farming and rural livelihoods. Position entails listening to and transcribing interviews and talks (in English) given by Dr. Vandana Shiva and other prominent environmental activists. Position may also include other reading tasks. My research is based near Dehradun in Uttarakhand, India and focuses on themes of agricultural change, rural livelihoods, and farmers’ struggles to protect their agricultural livelihoods. I am associated with Navdanya, an NGO that works with farmers to support their transition to organic farming. I use qualitative methods (interviews, participant observation, etc.) to learn about farmers’ experiences and perspectives about rural change, urbanization, and modernization. From this experience, you will learn about a variety of topics relating to sustainable agriculture, the global food system, social movements, food sovereignty, and related subjects. I am also happy to talk with you about my research and the process of conducting fieldwork if that is of interest. Motivation and interest in the subject matter; attention to detail. Depending on student’s skills, other tasks may arise over the course of the semester. I am looking for a motivated undergraduate who is fluent in Hindi who is interested in transcribing (in Hindi) and possibly translating (into English) interviews. I may also request other documents to be translated. My research is based near Dehradun in Uttarakhand, India and focuses on themes of agricultural change, rural livelihoods, and farmers’ struggles to protect their agricultural livelihoods. Interviews concern farmers’ practices, their shift to organic farming, and their perspectives about rural change, urbanization, and modernization. From this experience, you will learn about farmers’ experiences of agricultural change in north India over the last several decades and learn about village life. I am also happy to talk with you about my research and the process of conducting fieldwork if that is of interest. Fluency in Hindi; attention to detail. Other tasks may arise over the course of the semester depending on RA’s interests and skills, including making maps, reviewing documents/academic literature, etc. Seeking a research assistant to help with collecting and analyzing news media documents on the introduction of genetically modified bananas in Uganda. This is a controversial issue with strong opinions on both sides being played in the media and the Ugandan parliament right now. At the moment, GMOs are banned in Uganda, yet it is argued that both proposed GM bananas could help farmers and consumers considerably. One variety, modified with a red pepper gene, is resistant to banana bacterial wilt, which has caused widespread losses for farmers across the country. The other, developed with support from the Bill and Melinda Gates Foundation, follows in the footsteps of golden rice (http://www.goldenrice.org/) and is fortified with vitamin A to reduce vitamin deficiencies in children. This project can be 1-3 credits depending on the student’s interests and time commitments. Ideally, the student will be responsible for help with all or some–depending on number of credits and interest–of the following: collecting news media sources from Ugandan and international sources, entering them into the qualitative coding software, and performing a preliminary analysis of key themes. This work will be a great way to learn more about evaluating source material, research with news media and periodicals, and qualitative textual coding. Ideal applicants will have a demonstrated interest in international development, agriculture, and a desire to develop skills in news media data collection and qualitative coding. Interest and/or familiarity with plant/ag science not required, but would be a plus. Must have completed ENGL 15 or equivalent as well as either GEOG 20 or GEOG 30 with a grade of B or higher. Seeking assistance with creating a digital timeline of agricultural extension programs run by the national government in Uganda. This work will support my dissertation which examines farmer and institutional responses to banana bacterial wilt in western Uganda. Specifically, over the past 30 years, Uganda has gone through some major transitions in agricultural development policy and in particular, agricultural research and extension policies. These changes have impacted the ability of farmers to respond to shocks like that of plant disease. The assistant would be responsible for producing a detailed, annotated, and properly cited and researched timeline using documents collected by me during my fieldwork in Uganda and additional internet and library sources to create a history of extension within Uganda. If the assistant is interested in visualization and graphics, an additional component of the project can be added to research information on digital humanities and visualization and create a digital timeline to present the work. This work will be a great way to learn more about evaluating source material, archival research, and digital humanities. Candidates should be well organized and attentive to detail. Experience with archival research preferred, but not mandatory. Must have completed ENGL 15 or equivalent as well as either GEOG 20 or GEOG 30 with a grade of B or higher. If interested in the visualization component of the project, be sure to describe previous relevant experience and/or coursework in design and visualization. Seeking a research assistant with experience in geospatial data management and cartographic design. This project will contribute to my dissertation research which investigates how a mysterious new form of kidney disease is reconfiguring land use and livelihood practices in Sri Lanka’s dry zone. The project will involve creating a series of maps, including: several study area maps (point locations, insets, demarcations of agricultural lands, surveyed administrative districts, agro-ecological zones etc), as well as a flow map of land settlers’ origins. The successful candidate should be well-versed in ArcGIS, with a sound grasp of cartographic design principles. Ideal applicants will have completed GEOG 361 and 363 with grade of B+ or higher. The successful applicant must be organized, disciplined, interested in the topic, and able to take initiative and work well independently.